"The Crucible will test your characters like nothing has before." 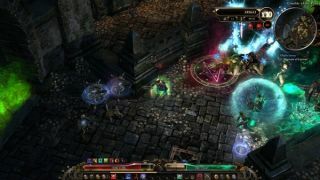 Dark and sinister Diablo 2-a-like Grim Dawn welcomes its ‘The Crucible’ DLC tomorrow. Dubbed a “harsh battleground filled with waves of Grim Dawn’s deadliest fiends,” the incoming expansion dumps players into four different arenas and tasks them with fending off 150 enemy waves—all for the amusement of the titular Crucible’s enigmatic overlord Lokarr. “But he is not a cruel master,” says the action RPG's developer Crate Entertainment. “Endure his trials and be rewarded with vast wealth; fail, and know only his scorn.” So, um, don’t mess up, yeah? If you picked up Grim Dawn via its website prior to or during its Kickstarter—or via the Kickstarter campaign itself—The Crucible DLC comes free-of-charge. If you didn’t, it’ll cost £4.49/$4.99 on Steam and GOG with a 15 percent release discount during its first week.